I have stayed at this hotel before and I Love the spacious rooms, the amount of rooms at the hotel and having a REAL BREAKFAST! Was a nice place to stay but nothing outstanding about it. Beds were confertable and it was like sleeping at home. Friendly people working at the frunt desk. Didn't use ther breakfast menue so don't know nothing about that. Where to find Baton Rouge hotels near an airport? How can I find hotels in different Baton Rouge neighborhoods? Where can I find hotels in Baton Rouge that are near tourist attractions? If you'd like to book comfortable lodging options in Baton Rouge, it is good to know that there is a treasure trove of suitable options. Expedia's extensive database features 42 hotels within a 0.1-kilometre (0.06-mile) distance of Baton Rouge's central area. 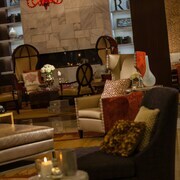 Would you like to book a room near the heart of Baton Rouge? The Hotel Indigo Baton Rouge Downtown and Hilton Baton Rouge Capitol Center can be found 1 kilometre (0.6 miles) of the town center. Sherwood Forest is a popular hotel neighborhood. Sherwood Forest is 14 kilometres (9 miles) from the center of Baton Rouge and has 11 of our hotels. The Sleep Inn South and La Quinta Inn & Suites Baton Rouge Denham Springs are amongst the places to base yourself in Sherwood Forest. 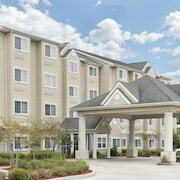 Other areas with a range of hotels are Denham Springs and Gonzales. The Hampton Inn Baton Rouge - Denham Springs and Comfort Suites are in Denham Springs, while Gonzales is where you'll find the Hampton Inn Gonzales and TownePlace Suites by Marriott Baton Rouge Gonzales. Port Allen is 2 kilometres (1 mile) from Baton Rouge's downtown, while Livonia is 35 kilometres (22 miles) from the center of Baton Rouge. The Hampton Inn and Suites Baton Rouge/Port Allen and Holiday Inn Express Hotel & Suites, a Baton Rouge-Port Allen are situated in Port Allen, while Oak Tree Inn Livonia - East and Oak Tree Inn Livonia West are located in Livonia. You may like to book accommodation near the Louisiana State University. The Hampton Inn Baton Rouge - I-10 & College Dr. is a drive away, as is the Staybridge Suites Baton Rouge-Univ At Southgate. Baton Rouge offers a solid selection of budget hotel and apartment options sure to satisfy thrifty travelers. The Comfort Inn Baton Rouge is 6 kilometres (4 miles) from the heart of Baton Rouge, while the Comfort Suites is 20 kilometres (14 miles) away. Different affordable accommodation options include the Belle of Baton Rouge Casino Hotel and the Best Western Magnolia Manor. 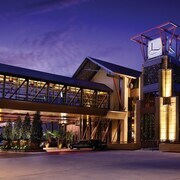 The L'Auberge Casino Hotel Baton Rouge is located 12 kilometres (8 miles) away from the middle of Baton Rouge. Another option is the Renaissance Baton Rouge Hotel, which is positioned 11 kilometres (7 miles) away. Two more Expedia-listed accommodation options include the Homewood Suites by Hilton Baton Rouge and the Embassy Suites Hotel Baton Rouge. Like to travel a bit further afield? Eastern Louisiana offers many options. Lovers of the great outdoors will appreciate Eastern Louisiana's streams and wetlands. In addition you could visit a selection of the area's historic palaces. Visitors in this section of United States of America enjoy hiking and shore fishing. Sherwood Forest is 14 kilometres (9 miles) to the east of Baton Rouge and is where you'll find Gateway 12 Shopping Center and Sharp Road Park. 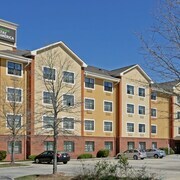 The Holiday Inn Baton Rouge-South and Quality Suites are just some of the hotel alternatives in Sherwood Forest. Or, you could consider staying in Historic Downtown Baton Rouge, 0.3 kilometres (0.2 miles) to the south of Baton Rouge, where you can choose from the Hampton Inn & Suites Baton Rouge Downtown and Radisson Hotel Baton Rouge. The Old Arsenal Museum and Capitol Park Museum are a couple of the most popular attractions to see when you're in Historic Downtown Baton Rouge. If you are traveling into or out of Baton Rouge Metropolitan Airport and are looking to stay nearby try Hilton Garden Inn Baton Rouge or SpringHill Suites by Marriott Baton Rouge North/Airport. What are the most popular Baton Rouge hotels? Are there hotels in other cities near Baton Rouge? What other types of accommodations are available in Baton Rouge? Explore Baton Rouge with Expedia.ca’s Travel Guides to find the best flights, cars, holiday packages and more!